Happy Thursday! How are your little ones (and big ones) doing in their first few days / weeks of school? Mine had his first day yesterday. Here he is sporting the messenger bag I made. He insisted upon bring a family photo as well as one taken with two of his close friends from preschool. It's a hard transition - moving to kindergarten. As the head of the school stated today, "the next big transition like this will be when they go to college." I can't even bring myself to think about that! I just want to enjoy every minute of who they are right now. Check out these Father’s Day Toppers! Or how about these Graduation Toppers? These banner cards are a creative way to spice up an everyday greeting card. My kids would have gone nuts to have this Toy Story Cake at their birthday party!!! Amazing! And welcome to Radiator Springs, a car board for her son’s matchbox cars. 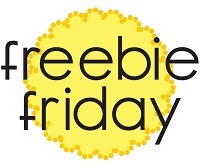 Laurelee also holds a Freebie Friday where she generously doles out a new design each week! Remember when I posted this dinosaur activity? Doodlebop still loves playing with it. Thanks again, Laurelee! Today, she is sharing with us these stylish free printable labels, along with a few ideas about how to use them! I there, I'm Lauralee from yellowmums and I may have a small obsession with labels :) But when it comes to school supplies, can you really have too many labels? I don't think so either, especially fun printed and personalized-for-you labels. Today that's what I'm sharing--some free printable Personalized Labels. The beauty of these downloadable labels is you only have to type in the name once and it fills out all the labels on the page! So nifty! (Or annoying if you wanted them all to be different . . . alas). I say some because there are a few color choices for you to choose from. Color is important, right? They all have the same font with light grey outlines around them. Those are the cutting guidelines. If you have a paper cutter you will be happy :) If not it won't be too bad! Stuff to label---lots of it! 1. Download the Labels of your choice. Open them up in adobe reader and click on a yellow box inside one of the labels. Type in the name of your choice. Push enter and watch as all the labels are magically filled in for you! Print out on plain old regular printer paper (don't worry the yellow highlights won't print). 2. Cut out with scissors or a paper cutter. Even if using a paper cutter you may need to cut a little bit with scissors since some of the lines don't go straight through from one edge of the paper to the other. 3. Pull out the packaging Tape and get taping! I cut my tape with scissors so it would have smooth edges instead of the jagged ones made by an included cutter. 4. Make sure the packaging tape goes over on all edges. We don't want any water getting underneath because you probably printed on an ink jet printer and they bleed if water touches them (which is a good reason not to print on the letter size sticker paper--kudos for being cheap). 5. The flag labels are the ones with the small writing on both ends. I put them on my scissors. I used a piece of double stick tape to stick the two flags together as well as the packaging tape on the outside (I didn't bother to do that with the flat ones). It's also a little bit tricky to get the tape through the scissor handle without getting it stuck. But once you do, CAREFULLY fold the pointy tips together first and then stick the rest of the tape down towards the handle. I had to clip the tape at the handle to make it fit a bit better, but it's really up to you. 6. For the crayons I didn't want huge pieces of packaging tape on my crayons so I cut a piece of tape the width of my tiny labels and then cut that in thirds and used all three pieces for three different crayons. Anyway, you get the idea. Not too tricky. Now all your stuff has pretty personalized labels that were fairly fast, and hopefully super cheap and everything is so organized right? Hah. Good luck finding the time to do it! Looks great! Thanks for linking up at the Rhinestone Beagle. Can't wait to see what you have for next week.